During the trial it was recorded that the three women had not been attending church. According to the court report: "Master Dean and justices in your court and jurisdiction, after all amiable recommendations, pleaseth you to know that we are informed by the depositions of certain honest men, passed before us in manner of an inquiry; in the which inquiry Katharine Cawches and her two daughters have submitted themselves in a certain matter criminal: wherein we be informed that they have been disobedient to the commandments and ordinances of the church, in contemning and forsaking the mass and the ordinances of the same, against the will and commandment of our sovereign lord the king and the queen." All three women were charged with heresy and on 1st July 1556 taken to Castle Cornet. On 4th July, Perotine Massey, Guillemine Gilbert, and Katharine Cawches were tried for heresy. The women claimed that they had been acting according to the religious policies of King Edward VI. However, according to the testimony of their neighbours, they had been unwilling to follow the religious ceremonies that had been imposed by Queen Mary. 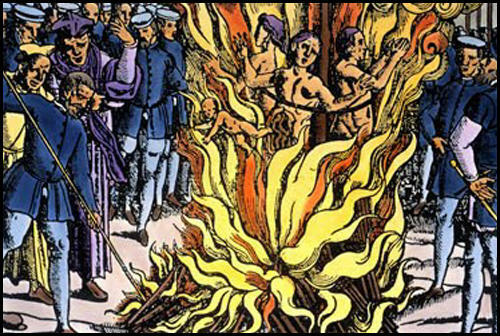 All three women were found guilty of heresy and condemned to be burnt at the stake. Perotine was pregnant. In pagan times pregnant women could not be executed, but Catholics in the sixteenth century thought it was acceptable to kill the unborn. Helier Gosselin was placed in charge of the executions that took place on 18th July 1556. All three were burnt on the same fire. John Foxe later recorded the deaths of the three women: "The time then being come, when these three good servants and holy saints of God, the innocent mother with her two daughters, should suffer, in the place where they should consummate their martyrdom were three stakes set up. At the middle post was the mother, the eldest daughter on the right hand, the youngest on the other. 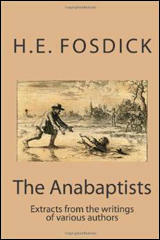 They were first strangled, but the rope brake before they were dead, and so the poor women fell in the fire. Perotine, who was then great with child, did fall on her side, where happened a rueful sight, not only to the eyes of all that there stood, but also to the ears of all true-hearted Christians that shall read this history. For as the belly of the woman burst asunder by the vehemence of the flame". Amongst all and singular histories touched in this book before, as there be many pitiful, divers lamentable, some horrible and tragical; so is there none almost either in cruelty to be compared, or so far off from all compassion and sense of humanity, as this merciless fact of the papists, done in the isle of Guernsey, upon three women and an infant, whose names be these as follow:- Katharine Cawches, the mother; Guillemine Gilbert, the daughter; Perotine Massey, the other daughter; an infant, the son of Perotine. The seventeenth day of May, anno 1556, in the isle of Guernsey, which is a member of England, in a town there called St. Peter's Port, was a naughty woman named Vincent Gosset, who, being evil disposed, went, the day aforesaid, to the house of one Nicholas le Conronney, dwelling in the town of the said St. Peter's Port, about ten of the clock at night; and there, taking the key of the house, (lying under the door,) entered into a chamber toward the street; where she, espying a cup of silver within a cupboard, took it away, and so conveyed herself out of the house again: who, immediately after this fact done, (whether by counsel or by what occasion else I have not to say,) brought the said cup to one Perotine Massey, an honest woman, dwelling in the said town, desiring her to lend her sixpence upon the same. Perotine, seeing the cup or goblet, and suspecting (as truth was) the same to be stolen, answered, that she would not take it: yet nevertheless, having knowledge of the owner thereof, took it to restore it again to whom it did appertain; and to the end she should not carry it to another, gave her then presently sixpence. Where moreover is to be noted, that Thomas Effart saith and testifieth, that knowledge was given by the said Perotine to Conronney touching the stealing of this piece, who eftsoons, upon the misliking thereof, attached the said Vincent Gosset of the trespass; who, being apprehended and examined upon the same, immediately confessed the fact, desiring to have one sent with her (which was Collas de Loutre) with sixpence to fetch again the goblet, where it was; and so she did. The next day following, the king's officers being informed of the premises by one Nicholas Cary, of the said town, constable, assembled the justices there to inquire and examine further, as well upon that fact of Vincent Gosset, as upon other griefs and things there amiss. So that after declaration made by the officers and constable before the justices, for that the said constable did report to have found a certain vessel of pewter in the house of the foresaid Perotine Massey, (who then dwelt with her mother Katharine Cawches, and her sister Guillemine Gilbert,) the which vessel did bear no mark; and especially for that there was a pewter dish, whereof the name was scraped out; their bodies upon the same were attached, and put in prison, and their movable goods taken by inventory. Within a few days after these things thus done and past, these three silly women, abiding thus in durance in the castle, made their supplication to the justices to have justice ministered unto them, viz., If they had offended the law, then to let them have the law; if not, beseeching to grant them the benefit of subjects. Which supplication put up, thereupon they were appointed to come to their answer the fith day of June, in the year aforesaid: upon which day; after strait examining of the matter, and the honest answering of the cause by the said good women, at the last they submitted themselves to the report of their neighbours, that they were no thieves, nor evil-disposed persons, but lived truly and honestly, as became Christian women to do, the false and untrue report of their accusers notwithstanding. So the cause being thus debated, after the inquiry made by the king's officers, they were found by the said neighbours not guilty of that they were charged with, but had lived always as honest women among them; saving only that to the commandments of holy chuh they had not been obedient, &c. Upon this trial and verdict of their neighbours, it was in fine adjudged, first, that the said Vincent Gosset, being attainted of felony and condemned for the same, should be whipped, and after, her ear being nailed to the pillory, should so be banished out of the isle without further punishment. And as touching the other three women, the mother with her two daughters, for their not coming to the church they were returned prisoners again into the castle the first of July. And thus far concerning the true discourse of this matter, with all the circumstances and appurtenances of the same in every point as the case stood, according to the faithful tenor and testimony of the Guernsey men, written with their own hands both in the French and English tongue wherein you see what false surmised matter was pretended against these women, and nothing proved; and how by the attestation of their neighbours they were fully cleared of the fact, and should by the temporal court have been dismissed, had not the spiritual clergymen, picking matter of religion against them, exercised such extremity in persecuting these miserable prisoners, that in no case they should escape their bloody hands, till at length they had brought them (as you shall hear) to their final end. For after the time of this declaration above mentioned made by the neighbours, whereby they were purged of all other things, and being then known of their not coming to the church, the bailiff, the lieutenant, and the jurats, thinking the matter not to pertain to them, but to the clergy, forthwith wrote their letters or mandate under their signets to the dean, whose name was Jaques Amy, and to the curates of the said isle: the contents whereof here follow. "Master Dean and justices in your court and jurisdiction, after all amiable recommendations, pleaseth you to know that we are informed by the depositions of certain honest men, passed before us in manner of an inquiry; in the which inquiry Katharine Cawches and her two daughters have submitted themselves in a certain matter criminal: wherein we be informed that they have been disobedient to the commandments and ordinances of the church, in contemning and forsaking the mass and the ordinances of the same, against the will and commandment of our sovereign lord the king and the queen. Whereof we send you the said matter, forasmuch as the matter is spiritual, to the end you may proceed therein after your good discretions, and as briefly as you possibly can, and also for that it pertained to your office; recommending yo to God, the which give you grace to do.that which pertaineth to right and justice.-- Written the first day of the month of July, in the year of our Lord 1556. After these letters and information thus addressed to Jaques Amy, dean, and to others of the clergy, the said women were again convented before the justice aforesaid with his assistants: in the presence of whom they, being examined of their faith concerning the ordinances of the Romish church, made their answer that they would obey and keep the ordinances of the king and queen, and the commandments of the church, notwithstanding that they had said and done the contrary in the time of King Edward the Sixth, in showing obedience to his ordinances and commandments before. After which answer taken, they were returned again to prison, until the others had an answer of their letter from the dean and his complices. During which time, the dean and curates gave their information touching the said women, and delivered the same to the bailiff and jurats, condemning and reputing them for heretics, the women neither hearing of any information, neither yet being ever examined at any time before of their faith and religion. Whereupon, when the said bailiff and jurats understood that the said dean and curates had not examined the women of their faith, they would not sit in judgment on that day, but ordained the women to come first before the dean and curates to be ex-amined of their faith. And so the officers, at the commandment of the justices, did fetch and present them before the said dean and curates. The which being accomplished and done, they were examined apart severally one from another: after which examination, they incontinently were returned again into prison. Then the fourteenth day of the said month of July, in the year aforesaid, after the examination above specified before Helier Gosselin, bailiff, in the presence of Richard Devicke, Pierre Martin, Nicholas Cary, John Blundel, Nicholas de Lisle, John le Marchant, John le Fevre, Pierre Bonamy, Nicholas Martin, John de la March, jurats; Sir Jaques Amy, dean, and the curates, did deliver before the justice, under the seal of the dean and under the signs of the curates, a certain act and sentence, the sum whereof was, that Katharine Cawches and her two daughters were found heretics, and such they reputed them, and have delivered them to justice, to do execution according to the sentence. When this was done, commandment was given to the king's officers to go to the castle to fetch the said women, to hear the sentence against them in the presence aforesaid. And they, appearing before them, said in the ears of all the auditory, that they would see their accusers, and know them that have deposed against them, because they might make answers to their sayings and personages, and to have their libel accordingly; for they knew not that they had offended the Majesties of the king and queen, nor of the church, but entirely would obey, serve, and keep the ordinances of the king and queen, and of the church, as all good and true subjects are bound to do. And for any breach of the king and queen's laws that they had done, they required justice. All which their reasons and allegations notwithstanding, the said poor women were condemned, and adjudged to be burnt, until they were consumed unto ashes, according to a sentence given by Helier Gosselin, bailiff: of the which sentence the tenor hereafter followeth. The seventeenth, or some others think the twenty-seventh, day of the month of July, 1556, Helier Gosselin, bailiff, ill the presence of Richard Devicke, Pierre Martin, Nicholas Cary, John Blundel, Nicholas de Lisle, John le Marchant, John le Fevre, Pierre Bonamy, Nicholas Martin, and John de la March, jurats: Katharine Cawches, Perotine Massey, Guillernine Gilbert, (the said Perotine and Guillemine, daughters to the said Katharine,) are all condemned and judged this day to be burned, until they be consumed to ashes, in the place accustomed, with the confiscation of all their goods, movables, and heritages, to be in the hands of the king and queen's Majesties, according and after the effect of a sentence delivered in justice by Master Dean and the curates, the thirteenth day of the month of July, in the year aforesaid, in the which they have been approved heretics. After which sentence pronounced, the said women did appeal unto the king and queen, and their honourable council, saying, that against reason and right they were condemned, and for that cause they made their appeal; notwithstanding, they could not be heard, but were delivered by the said bailiff to the king and queen's officers, to see the execution done on them according to the said sentence. (2) John Foxe, Foxe's Book of Martyrs (1563) page 196 of Google edition.